There is one proven practice exercise that helps you improve chess ratings and stay in shape while having fun - chess puzzles. 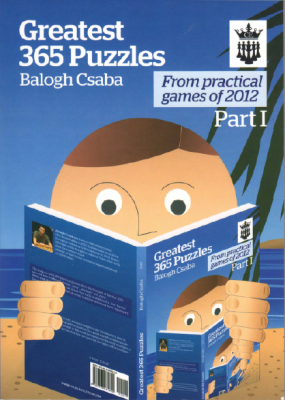 And what better than having the latest puzzles from the year 2012 by a top GM, and all that in one book! Many other puzzle books have the content based on artificial positions, but GM Balogh takes a modern approach, seeking the practical aspect of the positions, taking the level of calculation to a completely new dimension. Dividing the book into different levels, including evaluation tests, and provoking the chess fan's thought to the maximum, the "365 Greatest Puzzles" book enhances practical motifs that can be used in your own games. If the links on mirrorcreator are NOT visible then either add mirrorcreator on your Adblock's white list OR disable Adblock on mirrorcreator OR temporarily disable Adblock OR use a browser WITHOUT adblock extension/addon. Another great post well done! Thanks for Sharing jiri!! Have you get part-II please?